Great strides have been made in running shoe technology over the past 40 years. While some prefer a fancy shoe with a thick, cushiony sole, others opt for a "barefoot" version with minimal layers so the foot can actually feel and grip the path or pavement. But can either shoe help prevent some of the common injuries runners frequently face? Three of four active runners sustain injuries, typically in the knee and lower leg. Runners who wear cushioned running shoes run heal-to-toe, or use a rearfoot strike (RFS) pattern. RFS is associated with longer strides and excessive load force--up to three times the runner's body weight--on the lower leg, knee, and hip. Minimalist, or barefoot, shoes promote the front or middle of the foot striking the ground first, known as a forefoot or midfoot strike (FFS and MFS). This pattern reduces stress on the knee, lower leg, and heel. Results suggest that changing gait patterns, from RFS to FFS, may help runners prevent some injuries. While the shoes themselves though are not credited with preventing injury, the less-cushioned minimalist footwear may encourage runners to naturally transition from RFS to FFS pattern. 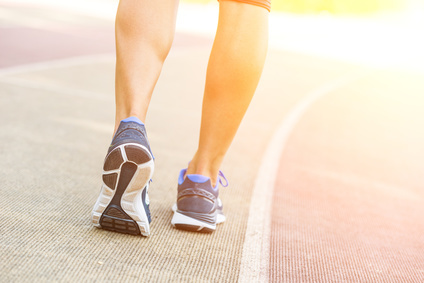 A change in gait pattern can also be achieved with traditional, thicker-soled running shoes through a conscious effort and repetitious training. Transitioning gait pattern should be a gradual one over many months, adhering to the 10 percent rule when increasing running distances. If you experience any pain or have issues when running, please contact us for an appointment. Scared of Sports After ACL Repair?